Veronica Gouws, Koketso Kgorinyane and Naomi Mokhine will soon be jetting off to Russia. 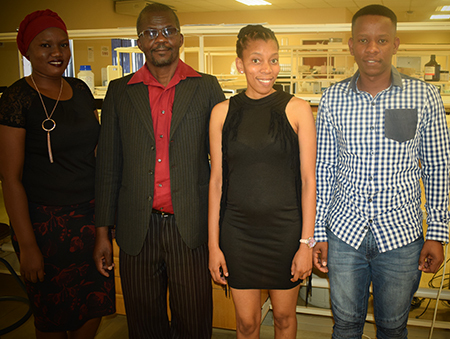 These three master’s students at the North-West University’s (NWU’s) campus in Mahikeng recently won a youth video competition. More than 30 students from Sub-Saharan Africa took part in the contest, ran by Rosatom* in cooperation with African Young Generation in Nuclear, the South African Institute of Electrical Engineers and the South African Network for Nuclear Education Science and Technology. Under the theme “Atoms Empowering Africa”, students had to post a two-minute video about peaceful atoms. The aim of the competition was to encourage young people between the ages of 18 to 30to film a 60- to 120-second video on their findings various nuclear applications and the benefits they might have for Africa. The top seven videos were loaded on the Rosatom Africa Facebook page, and the creators of the three videos with the most “likes” walked away with an all-expenses paid trip to Russia. Two South African teams and a team from Tanzania walked away with the spoils. The NWU team came out top with their video “How would you explain the benefits of the peaceful atom to your fellow Africans?”. A tour of Russian culture, traditions and cuisine. *Rosatom is a Russian state-owned corporation with its headquarters in Moscow and a footprint in most parts of the world. It is one of the global technological leaders, and brings together nuclear power and power engineering assets. Naomi Mokhine, Prof Manny Mathuthu, Veronica Gouws and Koketso Kgorinyane.